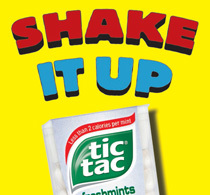 Ferrero USA's Tic Tac brand will launch its Shake It Up initiative this month to connect with 18- to 35-year-olds. Objective: Ferrero USA's Tic Tac brand will launch its Shake It Up initiative this month to connect with 18- to 35-year-olds. The year-long campaign will kick off at the Sundance Film Festival, where Tic Tac will sponsor arts organization Gen Art's screenings and events. Idea: Tic Tac initially planned to drive consumers to an interactive microsite, but research prompted a tactical change. A survey revealed that 18- to 35-year-old consumers are less likely to visit a food or mint brand's website hours after viewing an ad, even if they had purchased the product. Digital elements will play a key role. These will include a mobile app that will let consumers scan a Tic Tac product or ad and interact with it through games, trivia, or images. Tools: Along with the mobile app, Tic Tac will incorporate social media, events, and ads, including a billboard in Times Square. The company plans to run contests on Facebook throughout the year. In addition to its sponsored events at Sundance, Tic Tac will organize other events across the US. Three agencies are collaborating on the campaign: MSLGroup for PR and social media, Merkley+Partners for advertising, and ZenithOptimedia for media. Measurement: The company will gauge success by the number of mobile app downloads, impressions, and product sales, as well as consumer engagement.